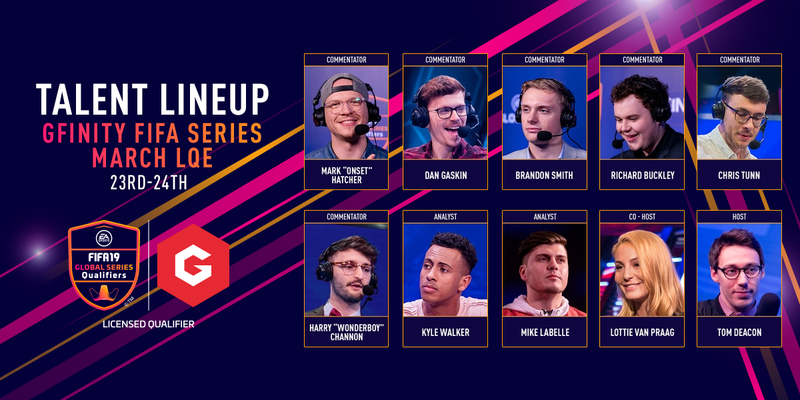 Today we are delighted to announce the broadcast team, who will be guiding you through this weekend's action, in the Gfinity FIFA Series March LQE! Our lovely co-hosts, Tom Deacon and Lottie Van Praag, will be returning once more to orchestrate proceedings. They will be join by Kyle Walker and Mike LaBelle, our resident FIFA experts. Finally, we're joined by our six commentators Mark Hatcher, Dan Gaskin, Brandon Smith, Richard Buckley, Chris Tunn and Harry Channon. You can catch all of the action this weekend on Twitch, Youtube, Facebook, Mixer and Twitter.